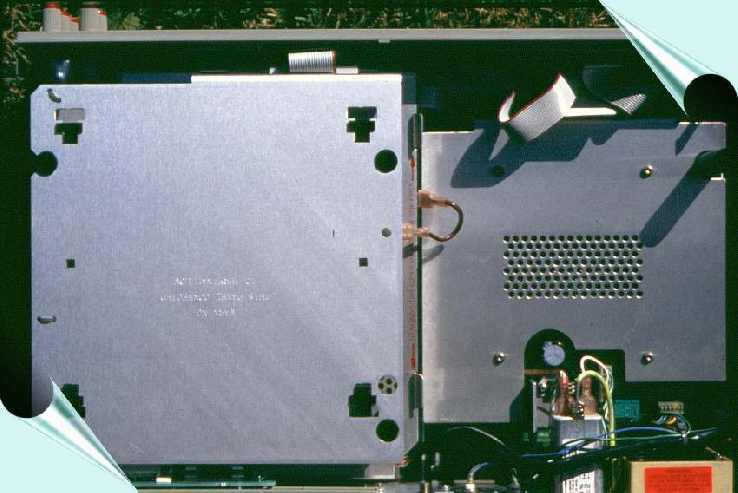 Inside the HP 3457A there is not much to see, everything is screened with EMI shielding. Bild zeigt den 3 Volt DC Bereich. Es ist das Ergebnis der Überprüfung mit einem automatischen Datron Kalibrator (April 2003). Ich habe dazu eine Software geschrieben, mit der sich der gemessene DC Wert sogar korrigieren läßt. Das Gerät ist sehr gut innerhalb der Spezifikation. Ein Kalibration war nicht erforderlich. Picture shows the 3 V DC range. It is the result of the examination with an automatic Datron Kalibrator (April 2003). I wrote in addition a software, with which measured DC value can be even corrected. The equipment is very good within the specification. Calibration was not necessary. Rechtes Bild zeigt den 3 Volt AC Bereich. Es ist das Ergebnis der Überprüfung mit einem automatischen Datron Kalibrator. (April 2003). Das Gerät ist sehr gut innerhalb der Spezifikation. Ein Kalibration war nicht erforderlich. Right picture shows the 3 V AC range. It is the result of the examination with an automatic Datron Kalibrator. (April 2003). The equipment is very good within the specification. Calibration was not necessary. The instrument can do slower high resolution measurements to 6 1/2 digits and up to 7 1/2 in math mode, or up to 1000 readings/seconds with the lowest digit resolution mode. 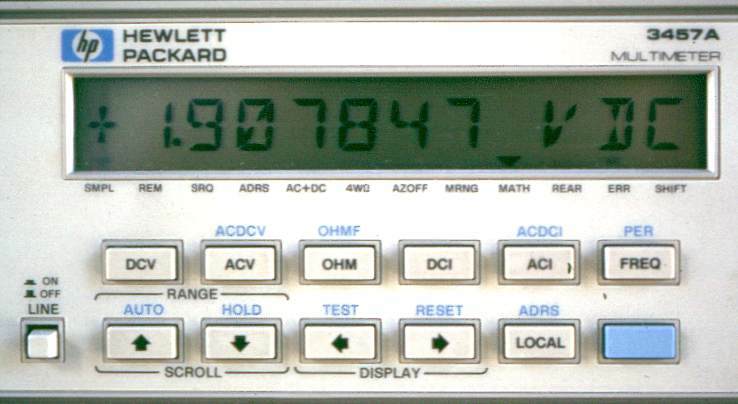 The instrument has a HP-Interface bus. Mathematical functions. On the backside there can be installed a plug-in-option 44491A Armature Relay Mulitplexer Assembly or 44492A Reed Relay Multiplexer Assembly. In all cases of my experience, I checked these types of instruments with high quality standards in a certified calibration labority, the instruments were always better than the given specification, even after long periods of recalibration! My compliments to the manufactorer. PLC = Integration in Power Line Cycles. When using integration times of 100 PLC, 10 PLC, or 1 PLC; multiply Number of Counts in the table by 0.1 for 5 1/2 digit readings, 0.01 for 4 1/2 digit readings and 0.001 for 3 1/2 digit readings. Tcal = Temperature ambient during calibration (should 18-28°C). TEMPERATURE COEFFICIENT: +/-(% of Reading + Number of Counts)/°C 6 1/2 digits displayed, Auto zero OFF are given for a stable environment (+/-1°C) and over a ten minute period. Multiply number of counts by 0.1 for 5 1/2 digits, 0.01 for 4 1/2 digits and 0.001 for 3 1/2 digits. 300V range is similar to the 30mV to 30V ranges, a little more bad.